In a token acknowledgement of the ritual of spring cleaning we've done a bit of purging this weekend, as well as some move pile A to pile B style "cleaning." I'm forever grateful to the scrappers who showed up 30 minutes after responding to my ad for scrap on craigslist to haul away some pretty worthless trash we dug out of the backyard, and to the Veterans of America (pickupplease.org) who will come by with a box truck to pick up donations, saving me a trip to Salvation Army. The scrappers turned out to be contractors who do demos, and with 5 old homes pending, they'll give me a call later this spring to see if I can use anything from the houses they're bringing down. 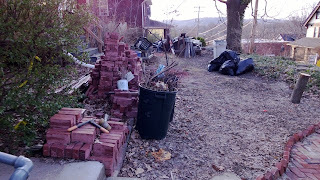 They also threw out a number for bringing my piles of bricks and slate to the back of the house (left over from the first two rounds of massive construction). While the number was reasonable, it was motivation enough to put on work gloves and move the first of the piles today (400 bricks). 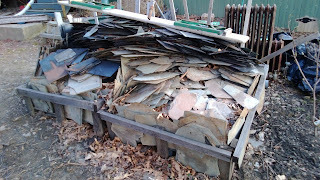 We have about 1000 more bricks to go, as well as two huge pallets of broken slates. 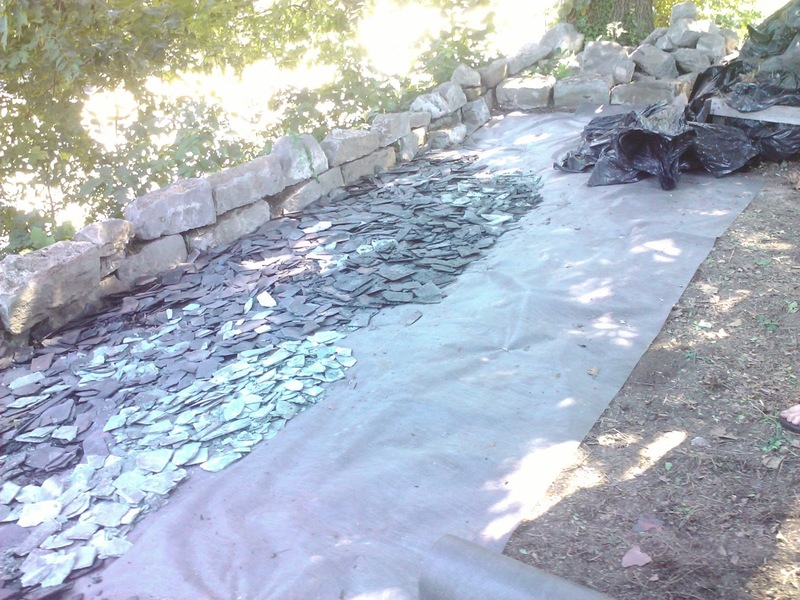 Why did we keep broken slates you ask? We honestly didn't have a good reason at the time, they were just so pretty . . . Our slates are Buckingham slates, grey with quartz so they sparkle. It turns out that they're among the best slates in the world, and will be forever out of our budget to replace, so paying to throw away our broken ones seemed foolish. 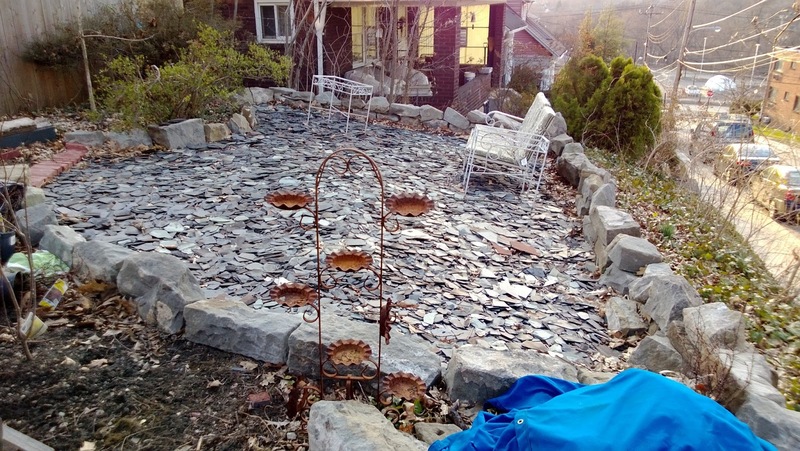 As an experiment, last fall we cleared a wild corner of our front yard, surrounded it with old foundation stone, and after putting down landscape fabric, filled it with broken slate (a mix of our buckingham and some old barn slates). It makes a surprisingly nice patio (although NOT barefoot friendly), was nearly free, and the pieces shouldn't migrate like pea gravel does. We're waiting to see how it ages, and may use the rest to make some paths through the garden (which doesn't actually exist yet, but anyway . . .). furniture and plants, but you get the idea . . .